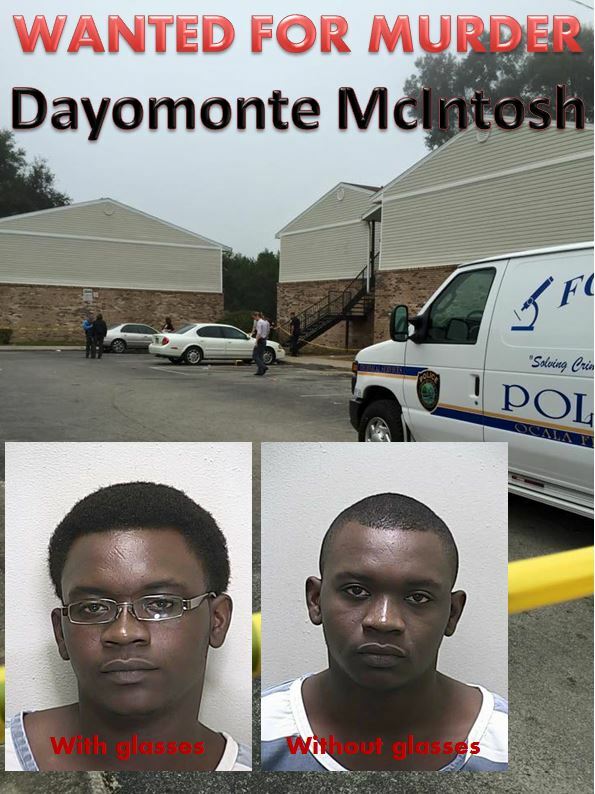 Dayomonte McIntosh wanted for murder. 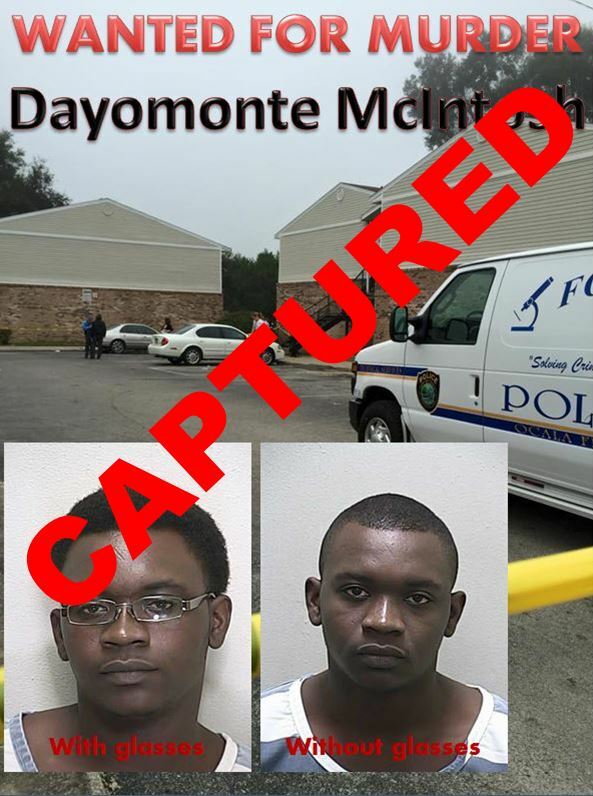 Ocala, Florida — According to the Ocala Police Department, Dayomonte “Dayo” Osteen McIntosh was arrested in Albany, Georgia on Thursday. The U.S Marshals Service Florida Regional Fugitive Task Force captured him at a relative’s home after OPD received a tip leading them to McIntosh’s location. Detectives said McIntosh has not been cooperative at all and has provided little information. McIntosh will be extradited back to Marion County, where he will face second-degree murder charges in the death of Jones, 23. Officials said the extradition could take days or weeks. He is currently being held at the Dougherty County Jail in Georgia. A manhunt for a murderer is now underway in Ocala. Last night, Ocala Police Department detectives received information that led to the identity of the suspect in the Monday morning shooting death of Antonio Jones, 23. The shooter has been identified as Dayomonte Osteen McIntosh, 21. A warrant has been issued for his arrest for one count of Second Degree Murder. Jones was gunned down in the Spring Manor Apartments parking lot Monday morning at approximately 8:30 a.m. He was murdered in the same area where another man was shot earlier this year. In the July shooting, detectives found that the homicide was the result of an ongoing feud between two to three groups of young adults in Marion County that all had common interests — drugs and unnamed females — that placed them in the Spring Manor area at the time of the shooting. One woman said if it were to be torn down, it would make a great public park. Sources said that a nuisance abatement might be in the works. A nuisance abatement, as a legal term, is a condition or use of a property that interferes with neighbors’ use or enjoyment of their property; endangers life, health, or safety; or is offensive to others. Because of the harm they do to others, Florida law authorizes local governments to use their police powers to compel the owners of nuisance properties to correct those conditions. If the owner fails to do so, the municipality can step in and correct, or abate, the conditions itself. According to authorities, neighborhood organizations and block groups need to understand the nuisance abatement laws, so that they can effectively press city government to take action and address nuisance conditions in their communities. The same also applies to property managers they said. Detectives were able to obtain security footage in the Jones shooting. The footage showed at least 10 subjects standing around the area when Jones was shot. Detectives said it appeared that the group was involved some sort of disagreement prior to the shooting. Multiple witnesses, who are not being identified out of fear of retaliation, said that the argument was over cooking pots. According to the arrest warrant, it also appears that a couple of females could have added fuel to the fire. During the argument over the pots, McIntosh pulled out a .40 caliber handgun and pulled the trigger, but the gun jammed. Once McIntosh was able to clear the jam, he fired the weapon until the magazine was empty. Detectives found numerous empty .40 caliber shell casings at the scene. Management for Spring Manor Apartments said neither Jones nor McIntosh lived in the complex. Witnesses told detectives that Jones and McIntosh were in relationships with females who stay in the complex. McIntosh fled the scene immediately following the shooting. Anyone with information is asked to call the Ocala Police Department at 352-369-7000. You can also submit tips through their mobile app, MyPD, or Crime Stoppers of Marion County at 352-368-STOP(7867), www.ocalacrimestoppers.com; or by texting tips to 274637 using keyword 368STOP. Anonymity is guaranteed.